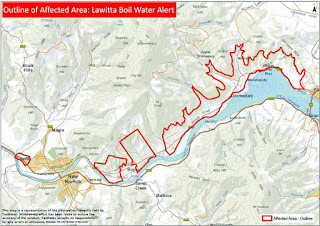 Areas within the red borders are affected by a boil-water warning. 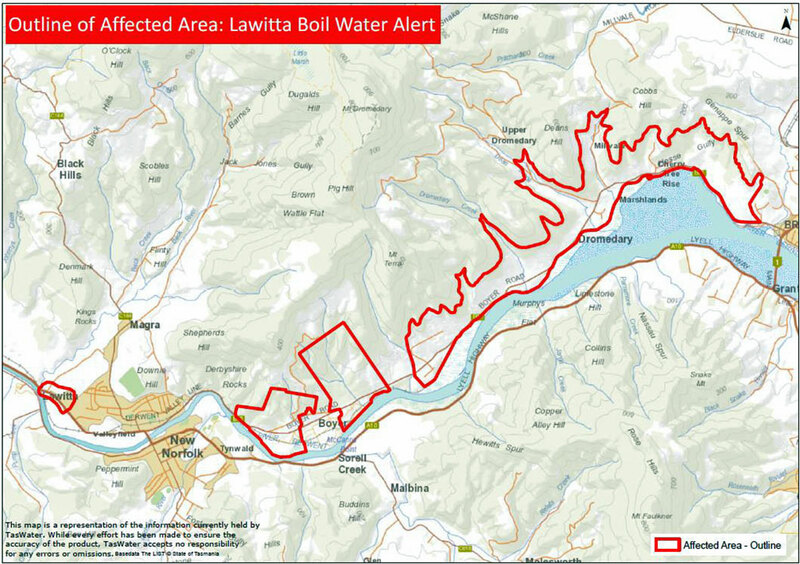 TASWATER and the Department of Health and Human Services (DHHS) have today issued a temporary boil-water alert to customers in Lawitta, Boyer and Dromedary. 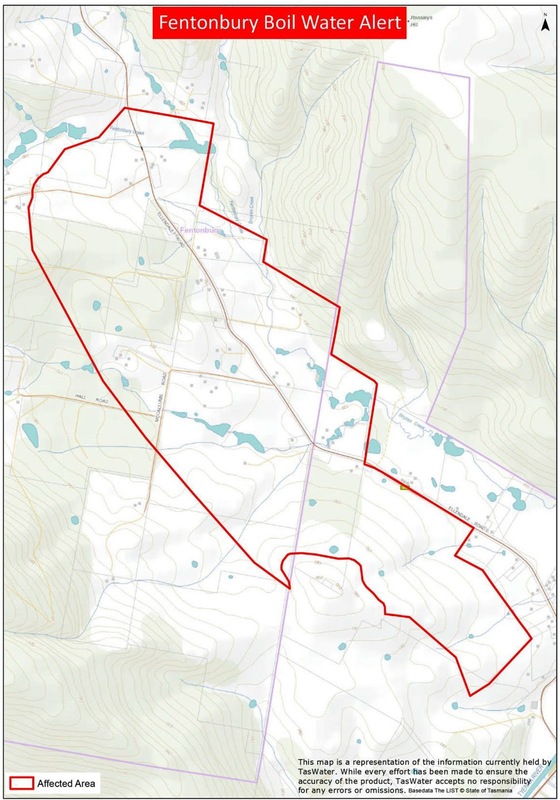 TasWater says water quality in the area has been affected by floodwater following recent severe weather conditions. Affected customers were notified by hand-delivered letters earlier today, advising them to bring their drinking water to a boil by heating the water until a continuous and rapid stream of air-bubbles is produced from the bottom of a pan or kettle. Kettles with automatic cut-off switches are suitable, and variable temperature kettles should be set to "boil". After heating, water must be allowed to cool before using it, and be stored in a clean, closed container for later use. Care should be taken to avoid scalding injuries. 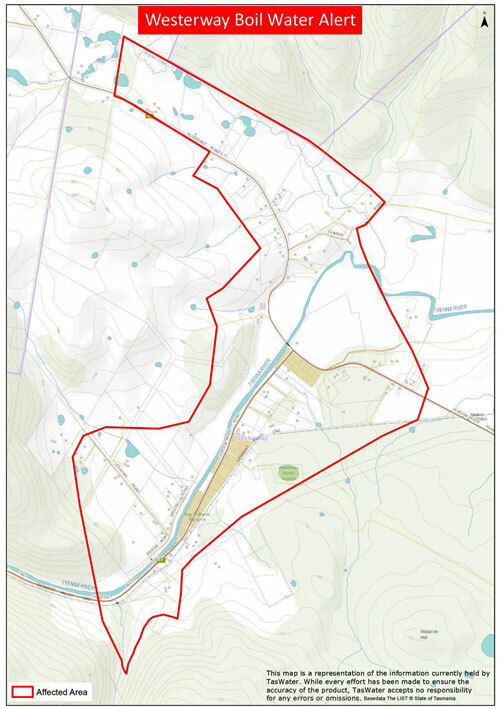 A temporary boil-water warning remains in place at Fentonbury, Westerway and National Park, where TasWater is working to resolve water quality issues as a result of heavy rainfall leading to discoloured water and an increase in sediment. unwell. If you are concerned that you may have been affected by contaminated water please contact your doctor and advise them about the boil-water alert. The state's chief veterinary officer has advised TasWater that there is no increased risk to animals drinking mains-supply water in towns under a Boil Water advisory. For details on boil water procedures or for more information, visit www.taswater.com.au or phone 13 69 92.